Six remarkable English language alchemical periodicals were published during the latter half of the 20th century, namely the Alchemical Laboratory Bulletins, Parachemy, the Australian Parachemica, The Hermetic Journal, Essentia, and The Stone. The serious student of alchemy is encouraged to obtain copies of these periodicals and to carefully study their contents. 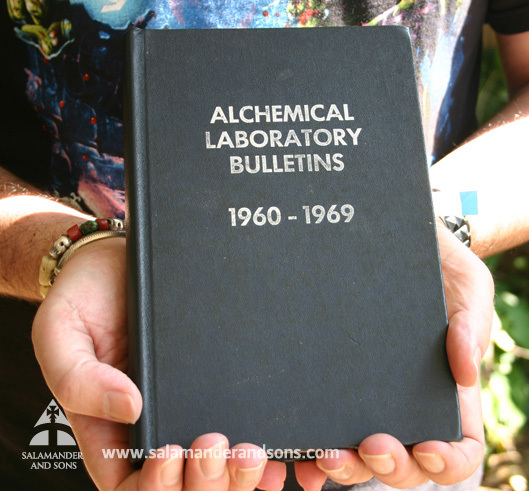 The Alchemical Laboratory Bulletins were published during the period 1960 to 1972 by Frater Albertus Spagyricus’ Paracelsus Research Society (P.R.S.) of Salt Lake City, Utah. The Bulletins were slender volumes, usually less than a dozen pages in length, and sparsely illustrated. But collected over a period of years the Bulletins amass to a sizeable tome more than 500 pages in length. Bound volumes of the Bulletins are extant in two versions: one covering the decade 1960 to 1969 (Nos. 1-41), the other the 13 years from 1960 to 1972 (Nos.1 -52). Each version appears bound in the distinctive dark blue imitation morocco fabrikoid with silver lettering, similar in appearance to many other P.R.S. publications. Our copy [below] came from the library of Artofferus, by way of the Australian doctor, scientist, antiquarian, and operative alchemist, Ross Mack. Following the completion of the cycle of Alchemical Laboratory Bulletins, Frater Albertus and the P.R.S. 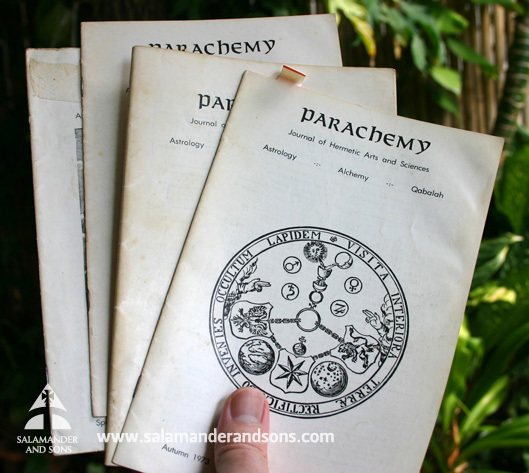 set about publishing a “new and enlarged JOURNAL OF PARACHEMY” – specifically Parachemy: Journal of Hermetic Arts and Sciences, Astrology, Alchemy, Qabalah. Vol. 1, No. 1 appeared in northern Winter 1973, edited by Robert Bremer and with art work credited to Alice Whipple. Later issues of Parachemy were edited by Mary Joyce Adams. The final issue of Parachemy – Vol. 7, No. 4 – was published in northern Fall 1979. Parachemy includes contributions from Frater Albertus, Israel Regardie, Arthur Fehres (later Artofferus), Frater Achad, Dale Halverstadt, Carl W. Stahl, Dr. A.K. Bhattacharya, Alec Gathercole, and Hans Nintzel, among others. Amidst the manifold treasures of Parachemy, Frater Albertus’ interview of Fulcanelli’s sole pupil, Eugene Canseliet, in Vol. 4, No. 4 (northern Fall 1976) documents the meeting of two of the greatest alchemical minds of the 20th century. Copies of Parachemy are not easy to come by, although some continue to be available via Frater Albertus Legacy Publications, administered by Angela Walz, daughter of Frater Albertus and Soror Emmy. 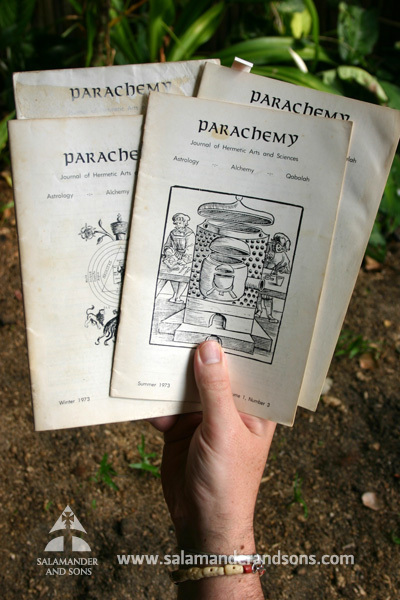 Rik Danenberg and Jeannie Radcliffe of Paracelsus College in Bendigo, Australia, have toiled to archive and index much of the contents of the seven volumes of Parachemy online; it is from this online archive that many have access to this increasingly rare alchemical periodical. Raise a goblet to Rik and Jeannie! The aims and objectives of this journal are principally directed towards students of the P.R.S. in Australia in an attempt to aid the student in integrating the triune concepts of Parachemy, Astrocyclic Pulsations (Astrology) and Qabalah within himself and in relation to the world in which he lives and works. We shall try to include material which is of practical value in regard to the laboratory as well as material which is stimulating intellectually and spiritually. Equal emphasis will be placed as far as possible on the practical laboratory work, on astrocyclic pulsations and on the QBL, because advancement to any degree in understanding of any one of these subjects depends on an equal advancement in the other two. Students, all being different, usually find an initial attraction to one of the three, sometimes to the detriment or imbalance of the other two. Thus a practical person may look for immediate results or proof of the Divine in the laboratory foremost. Another will find intellectual or philosophical illumination in the QBL, perhaps to the detriment of laboratory activity or the application of astrological cycles to their life. But all three are aspects of the One when understood, and should be applied concurrently. Students are invited to contribute their ideas, illuminations and problems to the journal for the general benefit since this journal is intended as a vehicle for communication between the students. Active communication and cross-fertilisation of ideas will produce a richer product. None of us are authorities in these subjects. We are all students and we are all ‘seeing through a glass darkly’ or groping in the mists which only rarely part for seconds at a time, showing us a small illumination. But, however small our illumination, or whether it be first or second-hand, it can always be profitably shared. One danger experienced in regard to spiritual or occult teachings in general is that of wandering too far away from the original given teachings and becoming lost in the burgeoning mire and confusion of other interesting and apparently parallel teachings. The curriculum of the P.R.S. is complete and adequate within itself. Also, it is noted by some students that communication occurs on a level other than the conscious. This does not mean that these are ‘the only true teachings’ and that no other teachings should be read or studied in conjunction. In fact, several other relevant and complementary books are and will be recommended. But these are limited in number. The living out of the teachings or putting them into practice is more recommended rather than too much reading about them. If one is to use a ‘system’ and progress in understanding, one should stick with the system rather than jumping from system to system like the occult shopper. The triune teachings of the P.R.S. is one system or way which has revealed itself as being rapidly illuminating for the devoted seeker of truth and understanding, as can be readily testified by many changed lives. Parachemica was published until southern Winter 1980, when the final issue – Vol. 4, No. 4 – appeared. With written content by the likes of Arthur Fehres, Don and Lenni Foster, and Kevin Masman, copies of Parachemica – like those of its sister journal Parachemy – are rare. Again, it is largely due to the commendable online archiving efforts of Rik Danenberg and Jeannie Radcliffe that the student of alchemy has any access whatsoever to these important writings. This Hermetic Journal has been established with the spiritual task of assisting in the rediscovery of the wisdom woven into Hermeticism and the particular spiritual discipline of Alchemy … Although this Journal will be focused on Alchemy it will seek to open bridges of understanding to the other facets of the Hermetic Arts, in particular, Magic, Kabbalism and Neo-Pagan ideas. Vast quantities of Adam McLean’s own original writings are to be found among the more than 1,000 articles published in The Hermetic Journal. Although some back issues of The Hermetic Journal remain available in bound paperback editions (each bound volume covering one year, with the years 1989 to 1992 available), it is acknowledged that original copies of The Hermetic Journal – particularly from the late 1970s and into the mid-1980s – cross the hands of antiquarians and collectors only infrequently. As such, the student of alchemy should secure one of the scanned electronic versions of The Hermetic Journal in its entirety, directly available from Adam McLean. By 1980, both P.R.S. sister publications – Parachemy and Parachemica – has ceased publication: Parachemy in northern Fall 1979 and Parachemica in southern Winter 1980. 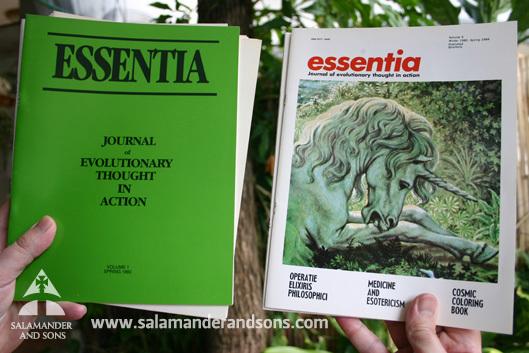 In their place, Essentia: Journal of evolutionary thought in action, which first appeared in northern Spring 1980. A quarterly publication of Paracelsus College (formerly the P.R.S., still of Salt Lake City), Essentia was brought forth by an initial publishing team consisting of Editor-in-Chief Mary Adams, Contributing Editors Kathryn Anderson, Dale Halverstadt and Frater Albertus, and Art Consultant Richard T. (Rick) Grimes. Over time the publishing team frequently changed: Frater Albertus occupied the role of Editor-in-Chief and, later, the role of Associate Editor and, finally, Editor; for some time Kathryn Andersen took on the Managing Editor role, solo; Art Kunkin was the Editor from Volume 2, northern Summer 1981 until Volume 2, northern Winter 1981; and Rick Grimes was joined by fellow Art Consultant Gertrud Schein, and Artist Leandro Della Piana. Worth noting is that, from Volume 3, northern Spring 1982 onwards until the demise of the journal with Volume 5, northern Winter 1983 / Spring 1984, the credited publishing team shrank to Editor – Frater Albertus, Office – Olive van der Meulen, and Business Manager – Viola Engel. For the final three issues of Essentia just Frater Albertus and Olive van der Meulen are listed in the publishing credits. Throughout the four years of its publication Essentia conducted an assuredly vital current of evolutionary thoughts in action penned by Frater Albertus and an array of international contributors including Dr. Werner Nawrocki (Germany), Gregory Sneddon (Australia), Isaac Beck (Belgium), Peter van Wunnick (Australia), Clive Riach (New Zealand), Ludwig Wriesing (Austria), Manuel Algora Corbi (Spain), Joseph Lisiewski (U.S.A.), Lawrence Principe (U.S.A.), Professor Manfred Junius (Switzerland / Australia), Israel Regardie (U.S.A.), Dale Halverstadt (U.S.A.), and Robert Bartlett (U.S.A.). Like Parachemy, copies of Essentia – including some complete sets – are still available from Frater Albertus Legacy Publications. The Philosophers of Nature was founded in 1987, as an educational and research organisation. Its primary activities included the distribution of course materials developed by Mr. Jean Dubuis, and educational workshops and seminars on the topics of Alchemy, Qabala and Western Esoteric Studies. The board of directors voted to close the organisation as of 31-Dec-1999, after transferring rights to all properties to Sue and Russ House [Triad Publishing]. The Stone ran for a total of 35 issues – Issue 1 was published in northern Fall 1990, with the final issue published in November / December 1999. Ken Miller edited the first 16 issues. From Issue 17 onwards, Russ House acted in that capacity alongside Editor-in-Chief Rick Grimes. Collectively, the writings of Jean Dubuis, Anthony M. House, Greg Boag (later Rubaphilos Salfluĕre), Bill van Doren, Paul Baines, Robert Bartlett, Kevin Townley, Mark Stavish, Henry Hintz, Sue House, Adam McLean, Joseph Caezza, Tim Scott, Wade Coleman, John Eberly, Arthur Fehres, John H. Reid III (JHR3), Beat Krummenacher, Curt Kobylarz-Schmidt, Rawn Clark, Kathleen Ahearn, Telémaco Pissaro (later Rubellus Petrinus), Paul Bartscher, Micah Nilsson, Ray Cullen, Steve Kalec, and Anthony Follari presented in The Stone represent centuries of alchemical labour and qabalistic experience. Highly recommended, a scanned electronic version of the 35 issues of The Stone is available from Triad Publishing of Winfield, Illinois. In future posts we will, at our leisure, present choice excerpts from these six remarkable English language alchemical periodicals.